Tiger Woods won the 2019 Masters Tournament, his first major championship in more than a decade- 11 years to be precise. The victory also marks Woods' first win at Augusta National since 2005 and fuels talks of Tiger Woods slowly but surely returning to his best. 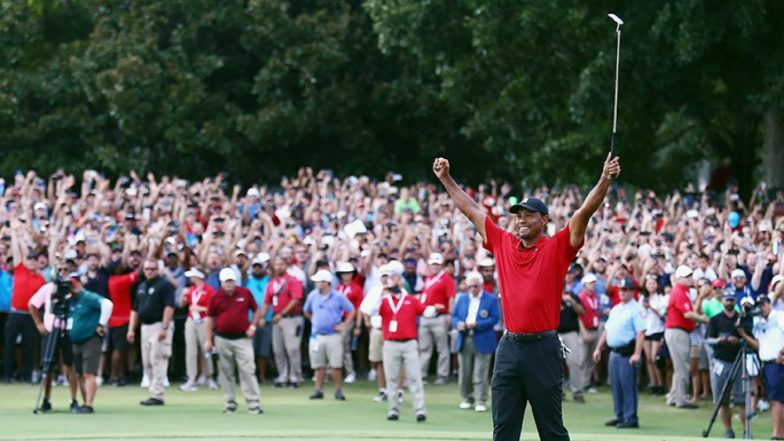 Tiger Woods Wins His First Title in Five Years at Tour Championship in Atlanta; Fans Congratulate Him on Twitter. The legend fought personal setbacks, career threatening injuries, rehab periods and poor form before winning the Masters Tournament on Sunday. Tiger Woods Lookalike at Dell Technologies Championship Amazes Fans and Twitter, Check Pictures. The crowd seemed to be waiting for this moment for a long time. Chants of "Tiger, Tiger" and "Tiger is Back" could be heard. The 43-year-old Tiger Woods has 15 majors to his name. Tiger is only second to Jack Nicklaus in the all-time list for most Majors. Nicklaus has 18 majors to his name. With this win, Woods now also holds the record for the longest gap between wins at the Masters. Woods has won 81 official PGA Tour events, second only to Sam Snead (82), and seven ahead of Jack Nicklaus's 73 wins.